“We may be criticised for decisions, but never for omission” Palmeiras president Paulo Nobre said when justifying the dismissal of medium-to-long term coach Ricardo Gareca. The renowned Argentine professional did not last three months at the Verdão, the club resorting back to the classical, Brazilian modus operandi described in a recent post: fire the coach. True, Gareca wasn’t delivering. Or rather: Palmeiras, under Gareca, were not delivering. Gareca is partially to blame, as he was constantly testing players and line-ups (13 games, 13 starting elevens) and wouldn’t forgo his philosophy of always playing offensively, even when his limited squad was facing stronger adversaries. That being said, Gareca’s failure must at large be attributed to Paulo Nobre, once again poorly making the bed we’re now all forced to sleep in. He kept Kleina much too long, taking Gareca on board – and players he requested – when most other teams in the Brasileirão were already tuned. He brought in a foreigner – who naturally would need more time to adapt – when there was little time available. He envisioned a medium-to-long term project – with the squad already partially cracking up due to the disastrous Kardec affair and growing influence from a few, spoiled fruit – when firm and urgent action was needed both from him and the new coach to arrive. In short: Gareca might possibly have been the right choice for Palmeiras, but he definitely arrived at the wrong time. Palmeirenses kept the faith in a turnaround, including yours truly. Gareca enjoyed massive support – and respect – from the stands, all the way to his dismissal and beyond. Truly remarkable for a coach who delivered so little, at least in terms of points. Anything Palmeiras wishes Ricardo Gareca the best of luck. This morning, Palmeiras announced their new coach: Dorival Júnior. 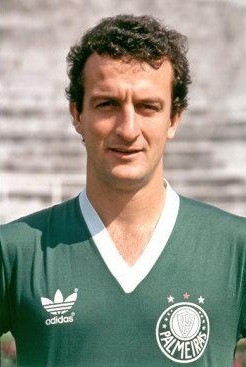 Dorival is a former Palmeiras player, having pulled on the jersey 157 times for the club between 1989 and 1992. He also happens to be the nephew of legendary Palmeiras midfielder Dudu. 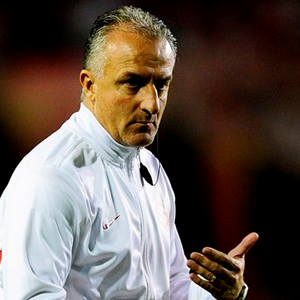 Dorival was runner-up as Kleina’s replacement earlier this year. As a coach, his previous clubs include Cruzeiro, Santos, Atlético Mineiro, Internacional and Flamengo. Palmeiras’ new coach has but one important national title on his curriculum: the Brazil Cup of 2010, with Santos. Dorival’s 2013 record of accomplishment does not still any nerves: he left Vasco da Gama in the relegation zone and worked the same magic with Fluminense (although he couldn’t really be blamed as he only took Fluminense on for the last five rounds, winning three games and drawing one). So far, in 2014, 52-year-old Dorival has been, well, taking it rather easy. Studying football. Including apparently spending some time at Chelsea F.C. Hope he’s relaxed, confident and ready for what’s to come at Palmeiras. The midfielder is free to sing a pre-contract. Although denied by the player and his staff, rumour has it that’s what he’s done. With SPFC. Can’t say I’m bothered. Especially not as Wesley isn’t cheap and has been underperforming, on and off the pitch, for some time. If fruit can be performative, that is. First action of Junior should be goalkeeper Deola instead of Fabio. A strongly disagree, Sara. I prefere Fábio, both on and off the pitch. Deola seems to be a bit of a trouble maker, I’ve been told. A primeira medida seria a não possível eleição de qualquer candidato com vinculo a nefasta figura de MUMU, que há 37 anos esta destruindo a historia da SOCIEDADE ESPORTIVA PALMEIRAS!